In today’s world, leadership actions and skills alone are not enough; we need intentional energy and presence (IEP) to back them up for best results. Attending to IEP can make a significant difference in the quality of your influence and impact in the world. Start developing a greater level of awareness and presence. Intentionally create the results you want and the impact you most desire. Be a leader not because of “title” but because you inspire and engage people. Manage yourself and your personal relationships more effectively. 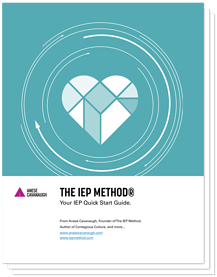 The IEP Method Quick Start Guide is easy to use, immediately actionable, and the first step to maximizing your impact. Get Started with IEP Today!